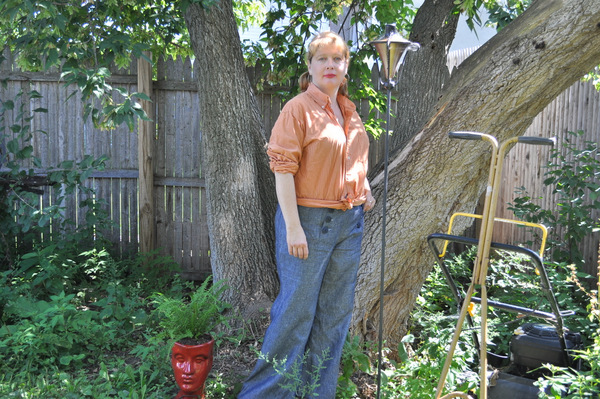 Finished Linen Pants–Just in time for Wool Season – Would I Wear it in Paris? Friends, summer is on its last legs here in Vermont, but what beautiful legs they are! And it really has been glorious since May. We deserve it too. 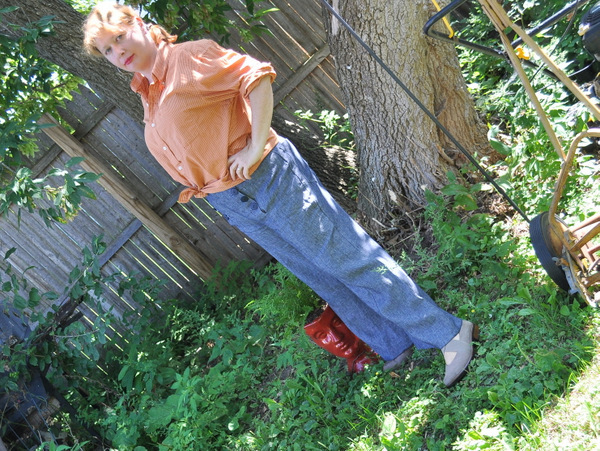 Anyway, I finished the Lekala linen pants that I ranted on and on and on about in my last post. And by finished I mean the hems are only basted and not entirely even but I am wearing the pants anyway. Please disregard the lawnmowers in the corner. We do use one of them every now and again. If I look cranky and grumpy in these picutres, I’m not. Except I was irritated with my camera. The test pictures looked great but once I got into the frame they came out as blurs of color. I guess it was artistic in a way. I am wearing a really nice shirt that belongs to my husband. It was the closest thing that I thought would go with the pants when I put them on. If I am too lazy to crop out a couple lawnmowers from a photo, then no one can reasonably expect me to run upstairs for a white or red t-shirt. And my friend Samantha took some nice photos. She was either really pregnant or had just had the baby when she took these. I think the former. 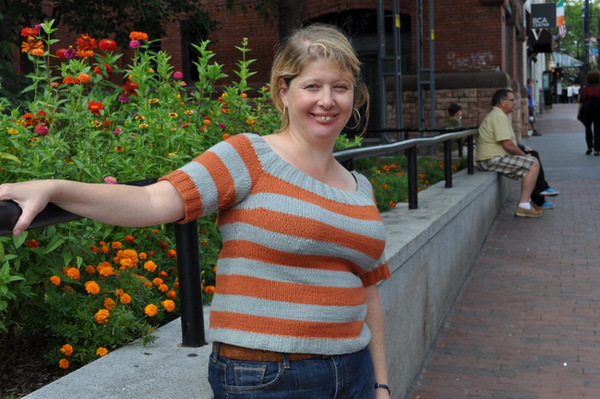 What I should do is cut off the ribbing and knit a couple more stripes. It’s a little on the cropped side. Okay, one more thing to share then I will shut up. In June my husband and I took a field trip up to Maine to visit my sister. On the way back we stopped at this antique town. It’s not that the town is an antique, although in Maine they all are. But it was a town of antiques. There were a ton of antique and antique wannabe stores. I picked up a mess of old buttons. I had hoped to use the dark red ones in the lower left and right corners on these pants, but I really needed eight buttons. I did use one of the amber ones in the center on an inside button though. I may post some work pictures of these pants in the future. If anyone decides to make this pattern and needs help, let me know. It was a little bit of a struggle. I love the pants with the shirt, you look great! As usual. Thanks! I was wishing you were there to take the pictures though. Those pants are just amazing, I would love to be able to do such detailed work. About as fancy I get at the sewing machine is the occasional circle skirt. 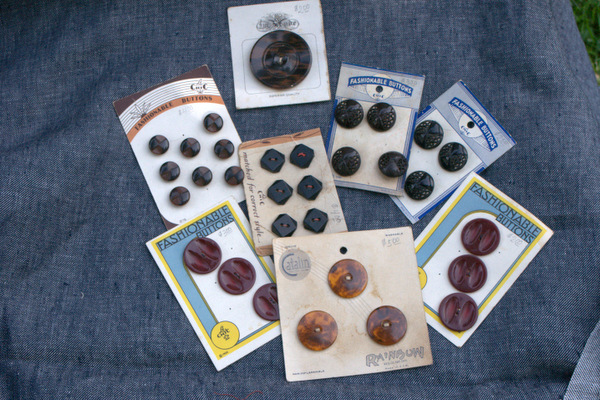 Vintage buttons are such a weakness for me, what a great find. Looking good! I never manage to match up my sewing with the seasons! Pingback: Pattern Reviews | Would I Wear it in Paris? 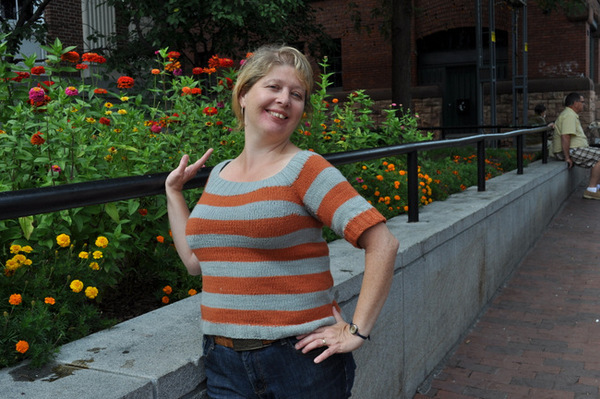 Pingback: Pattern Reviews – Would I Wear it in Paris?